Our phone cases have a molded front which is firm enough to protect your phone from bumps. They are made in vegetable tanned leather in many embossing patterns and colors, riveted belt-loop, either antique silver or antique-brass fittings. 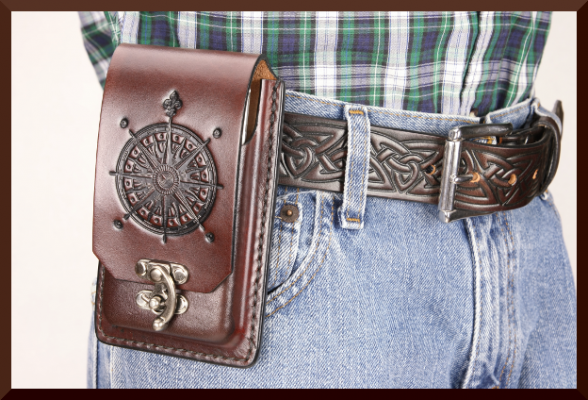 Our smart phone cases can comfortably accommodate phones as wide as 3 1/4", as tall as 6 1/2" and up to 5/8" thick. Measure your phone including any protective covers or cases you keep the phone in and we will choose the case that best fits your phone. All of our cases have a three inch belt loop, your choice of patterns, colors and hardware. Contact us if you have a question about a specific phone model or custom sizing.